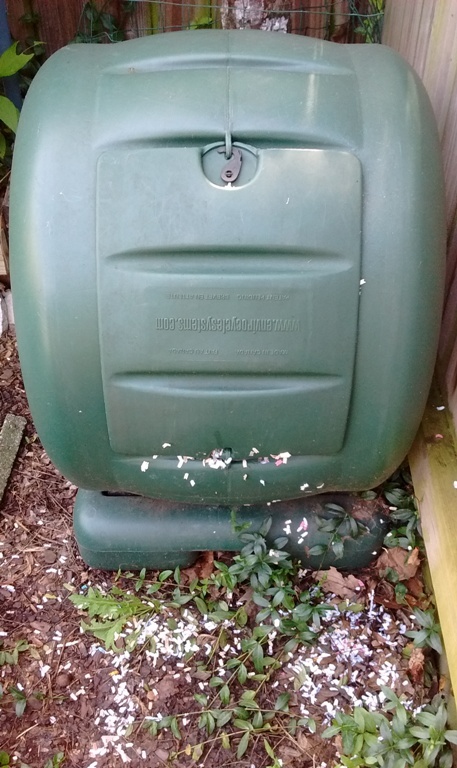 A reader asked whether any of my multiple worm bins have overwintered outdoors. The answer is yes. Well, kind of. 2. Then I started a store-bought dealie with four layers. I am still only on the second layer almost a year later. I can’t figure out how to get my wigglers to eat and reproduce very fast. And I’m not sure when to harvest the castings. But I haven’t completely killed anyone off yet—that I know of. 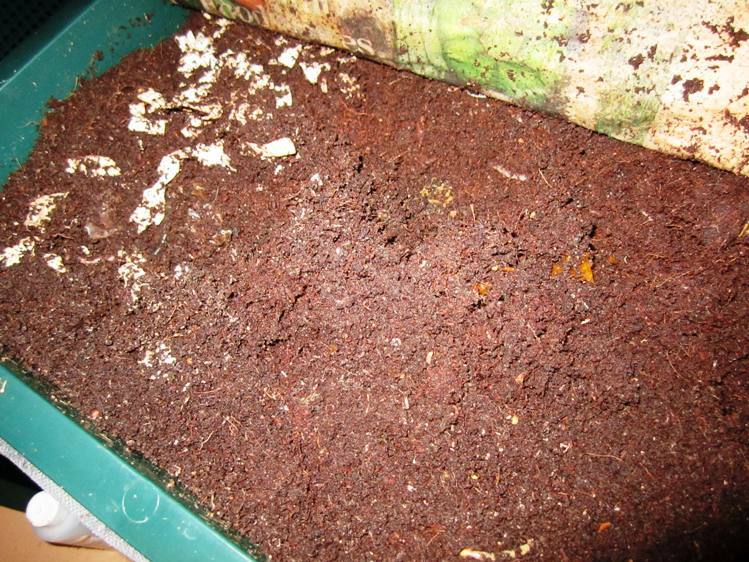 Here’s a top view of my Sunleaves bin. I used coconut coir as the bedding. 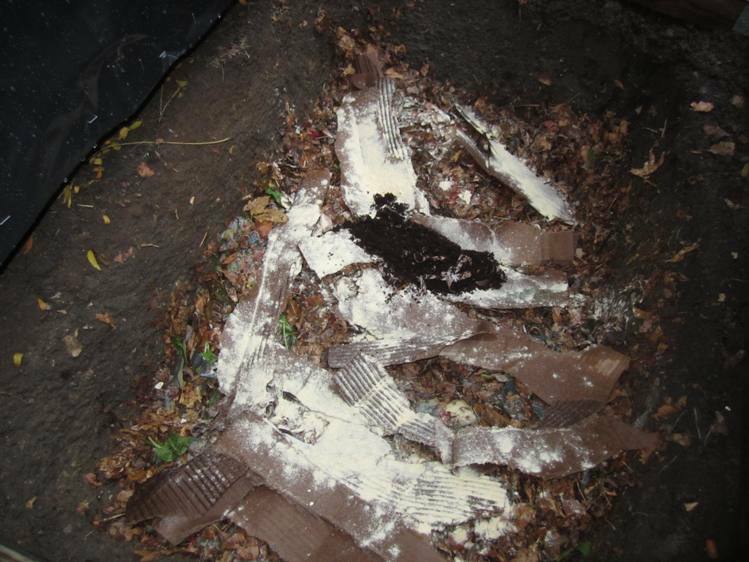 This was before I added the second layer, using shredded office paper as the bedding. My store-bought worm bin, which stays in the basement year-round. Unfortunately I forgot to document the digging and building phases. 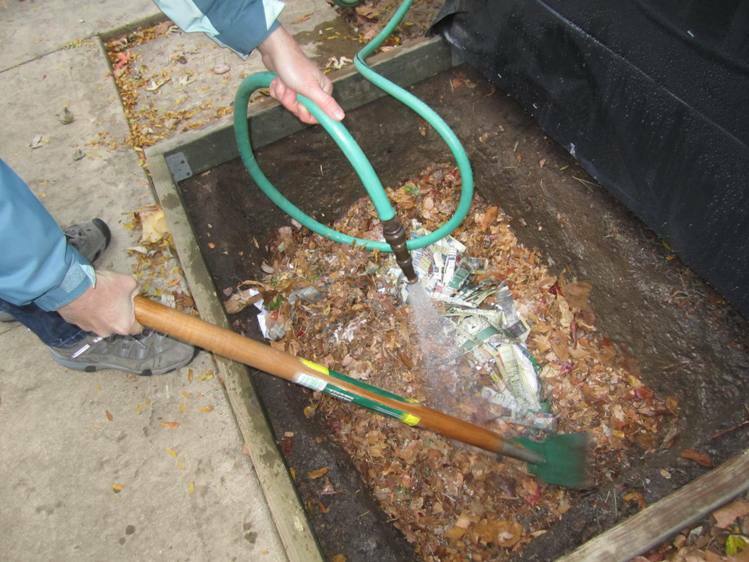 We started off by putting shredded leaves from our yard (and the neighbors’) into the pit, without adding any worms. We cover all our garden beds with the same stuff. 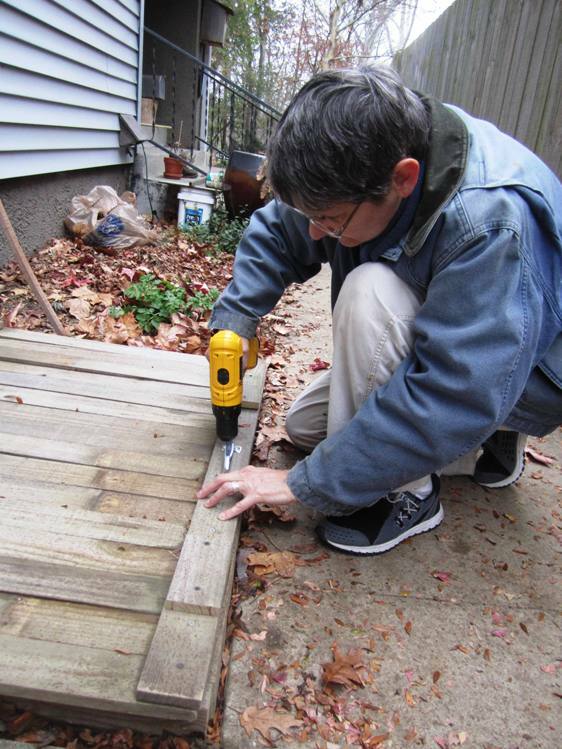 Judy affixing hardware to the lid, which I believe was cobbled together from old pallets. At the time I did not have a paper shredder that worked, so I geeked out on hand shredding things for a while. I just really like the idea of worms eating stuff like phone books and toilet paper rolls! 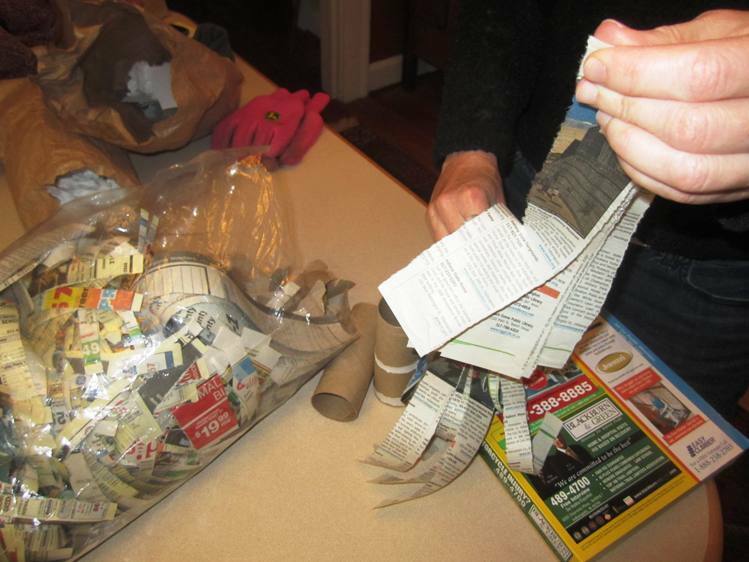 A very patient friend spent an October evening helping me tear up paper to add to the shredded leaves. Worm farming = big fun for all! 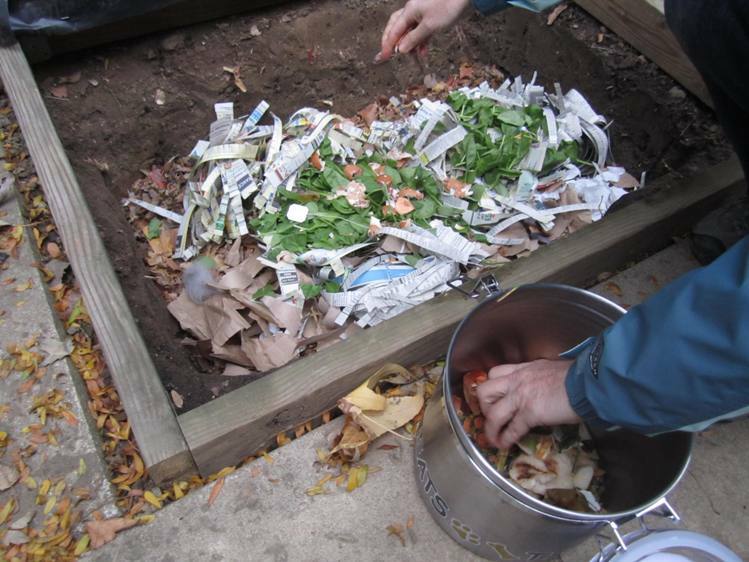 We added the shreds to the leaves along with some vegetable scraps for worms to munch on. Creating a nice buffet and bed for the wigglers. The next step was to moisten everything well. Worms do not like dry places. Mixing and moistening. I must not have had any rainwater. The book said something about worms appreciating the channels in corrugated cardboard, so I added some wet strips of cardboard. It also said they go crazy for cornmeal or wheat flour. We had a bag of flour that a mouse had chewed through, so I sprinkled some of that on top. Then it was Wiggler Time. The dark stuff is a handful of bedding and worms from the indoor bin. 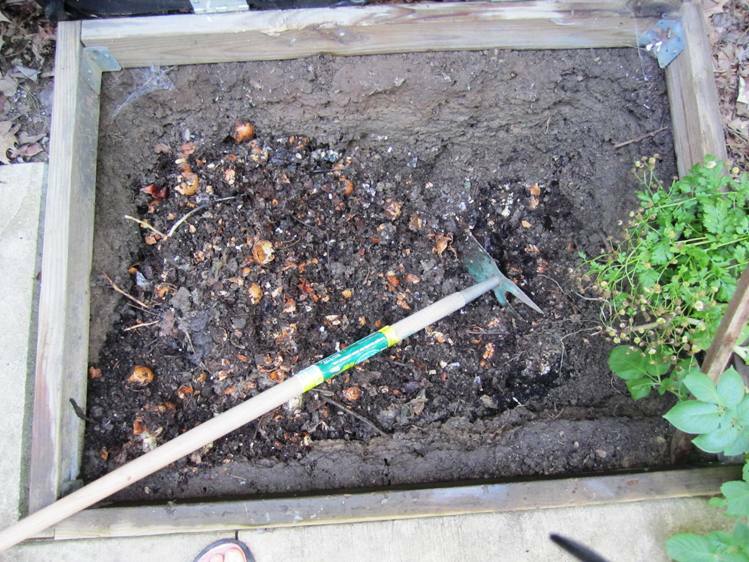 After that, we just tossed our kitchen scraps on top, crushing egg shells as best we could with a hoe. We did it all winter long, except when the lid was frozen shut or buried under snow. Lots of brown eggshells still showing. What can I say, I eat a lot of eggs. There’s still a fourth bin to talk about, also outside, which is new this summer. But that might be for another day. Let me see how it works out first! Thar be worms in that thar bin (unless they’ve perished in the heat). 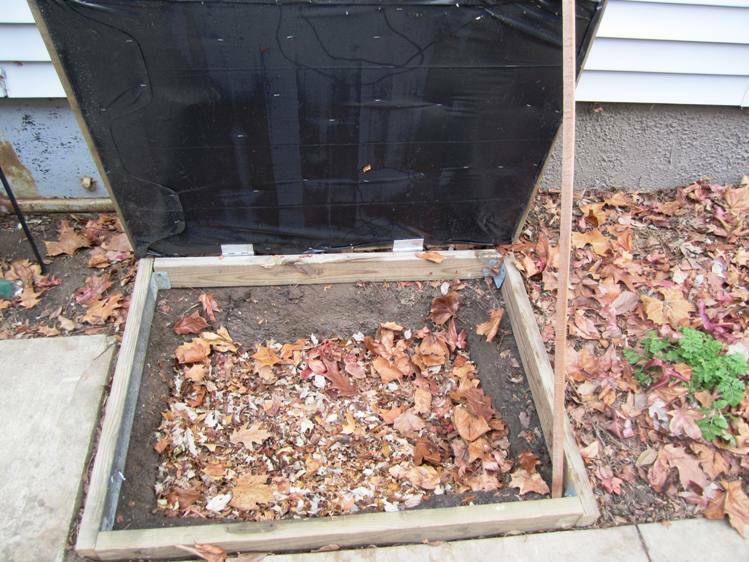 This entry was posted in Homesteading and tagged Castaway Compost, Compost, DIY, DIY worm bin, Do it yourself, Garden, organic gardening, Permaculture, Small but Mighty, Sunleaves worm bin, Sustainability, Vermicompost, worm composting, Worm Pit. Bookmark the permalink. So glad to hear it. Always rewarding to find a receptive audience. All best to you! After reading your post, I think I’ll give it another shot. Last year I started an outside bin in November, which seems really idiotic to me now. Then a vole broke in. Needless to say there wasn’t much success. Maybe if they’re established BEFORE arctic temperatures hit there’s a better chance of success. I’ve read that elsewhere too, so here’s hoping. And I plan to cover the bottom with hardware cloth that will let the worms roam if they need to, but won’t allow furry creatures in.